A giant planet – the existence of which was previously thought extremely unlikely – has been discovered by an international collaboration of astronomers, with the University of Warwick taking a leading role. 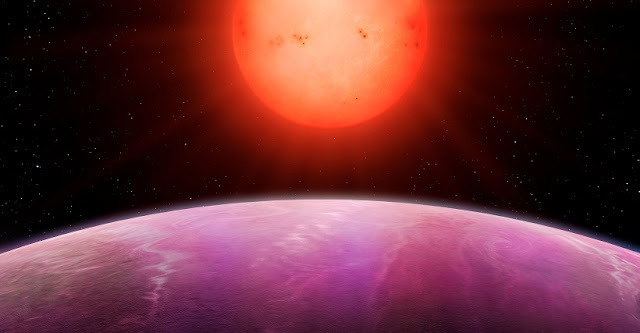 New research, led by Dr Daniel Bayliss and Professor Peter Wheatley from the University of Warwick’s Astronomy and Astrophysics Group, has identified the unusual planet NGTS-1b - the largest planet compared to the size of its companion star ever discovered in the universe. Its existence challenges theories of planet formation which state that a planet of this size could not be formed by such a small star. According to these theories, small stars can readily form rocky planets but do not gather enough material together to form Jupiter-sized planets. The planet is a hot Jupiter, at least as large as the Jupiter in our solar system, but with around 20% less mass. It is very close to its star – just 3% of the distance between Earth and the Sun – and orbits the star every 2.6 days, meaning a year on NGTS-1b lasts two and a half days. "The discovery of NGTS-1b was a complete surprise to us - such massive planets were not thought to exist around such small stars. This is the first exoplanet we have found with our new NGTS facility and we are already challenging the received wisdom of how planets form. The research, ‘NGTS-1b: a hot Jupiter transiting an M-dwarf’, will be published in the Monthly Notices of the Royal Astronomical Society.